Voice-activated assistants make life so much easier. They are able to search the internet, schedule events and alarms, adjust hardware settings on the device, change settings on home appliances, and show information from the user’s accounts. Soon they will be able to identify objects and gather visual information through the device’s camera, send money and identify songs. As technology continues to power the Age of the Customer, advances in artificial intelligence and machine learning are changing the way we do business. Conversational user interfaces are becoming widely adopted; voice-first customer service is a great way companies can offer customers help when and where they need it. It is an emerging channel for strategic brands to find new ways to share information and expand their offerings. Although today’s usage is minimal, with only 19% ever trying voice commands for help and 6% doing it frequently, companies need to be preparing to offer this emerging channel. Introduction of a well-designed voice-based user experience (VUX) would likely increase voice-first support adoption with smart devices. A recent study by Social Lens Research identified several voice-first trends that point to potential VUX use cases (see the Voice-First CX Experiences Infographic). Chat: Enhanced voice artifical intelligence (AI) chat will allow users to do more advanced and streamlined self-serve via this channel. Phone: AI-enhanced phone support will personalize, improve and speed service by equipping agents with customer data, resolution paths, and advanced decisionmaking for refunds/make good gestures and offers. Which companies are leading the way in VUX? You likely won’t be surprised to see these names: Amazon and Google. Amazon Connect’s integration with Salesforce allows companies to input frequent customer requests into the platform to help the AI determine where to guide the customer (place an order, solve a product issue, etc.). The contact flow begins with the AI gathering information and determining what the customer needs; if necessary, the customer can ultimately be transferred to a live agent. Capital One, an Amazon Connect customer, has built out an Alexa skill as well. Customers can now use the Amazon Echo and Amazon Echo Dot to inquire about their credit card, checking and saving, and auto loan accounts. Customers can ask Alexa questions as sophisticated as how much they spent at Starbucks last month using funds from their Capital One account. Google Contact Center AI operates similarly and is partnered with companies such as Deloitte, Cisco and Vonage. Google AI seems to have recovered well from its Google Duplex introduction and subsequent backlash. (Some have criticized Google Duplex for sounding too realistic, causing it to engage in arguably deceptive practices when interacting with humans.) Google’s AI is designed to work within existing partner contact technology, so that integration into a company’s VUX is simple and effective. Google’s AI uses open-ended questions instead of a phone tree to determine a customer’s history and assess what’s needed. Genesys is currently working to fully integrate Google AI into their voice-user interface. 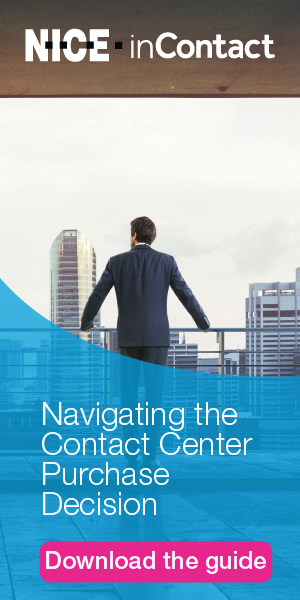 Contact Center AI, a virtual agent, first answers the call and addresses the customer issue, if possible. If not, the agent passes the call to a human representative. That representative is helped by an Agent Assist system that continues to monitor the call and provide supporting information as needed. Mass availability is expected to begin in early 2019. (Genesys also uses Amazon Connect’s voice AI services on a different platform.) Imagine the productivity gains when this is operating at scale, not to mention the consistency across the entire population of contacts. Ticketmaster is looking into the viability of using Dialogflow by integrating it with its customer service IVRs to assist with intent recognition. They realized that many of their customer calls are about something general (like what time an event starts) yet complex, since each event they manage begins at a unique time and occurs in a unique place. Dialogflow could help them answer specific, complex questions within their current IVR system so that customers could receive the information they need without tying up agents with logistical questions. American Financing is also taking advantage of Contact Center AI to improve their call-routing capabilities. By using Vonage’s CX Enablement Suite integrated with Google Cloud Contact Center AI, American Financing can intelligently route calls to high-skilled agents or after-hours support internally. AI is a cost-effective way to intelligently route calls and create a simpler, hassle-free customer experience. Some early adopter companies are already using voice-activated assistants. For those who are just starting out, the following are some considerations for developing your VUX roadmap. Journey mapping is still one of the best ways to understand what customers experience when interacting with your brand. They also are critical to designing the optimal future state. So, determine a potential use case for the voice-activated assistant channel and then map the customers’ existing and desired states to see what’s possible. And don’t forget to include the employee journey, which is as important to understanding where you are and where you want to go with your overall brand experience. As you are designing your VUX, be sure to consider the context of the contact. To do this thoroughly, use the 5W1H method: who, what, where, when, why and how? Understanding the nuances of the customer contact will help determine the best interactions for voice-assisted help. For instance, customers who contact from home in the morning while getting ready for work or from their office when in front of their computer likely will have better experiences with voice assistants than those who are on the bus or at the library where background noise and distractions could exist. Also, high-stakes and complex interactions (such as an upset customer dealing with an ongoing issue or financial transactions) require more rigor and development than basic help scenarios (like password reset or information inquiry). Finally, start small, keep close watch of how things are going, and expand from there. John Goodman, a stalwart pioneer in the CX field and one of my mentors, always reminds me that a “small success is better than a big disaster.” Keeping your finger on the customer’s pulse is always important, but it has an increased significance when you are trying something new and innovative. Create special ways to the listen to the voice of the customers who are participating in voice-assisted interactions, perhaps through a small panel, community or focus group. Enlist feedback regularly, consistently and more frequently than you typically would. And, again, don’t forget to get employee feedback on what they are hearing from customers. Lastly, increase your attention on the measurement of operational impacts: What’s happening with other channels? Are staffing needs changing as a result of the voice-assisted channel? What other processes or systems are impacted? Does your budget need to be adjusted to accommodate this channel? Customizable VUX is a great way for companies to use voice commands to personalize their customer service and help figure out what customers need before (or if) they reach a live agent. Voice-first is the future of CX, and we are sure to see many technology advances and applications in the coming years. Companies and developers need to determine how to best integrate new and existing voice-first CX strategies with smart devices so that customers can use voice to get easy, seamless and timely support. With new devices at lower price points flooding the market, customers are surely expecting it! Crystal Collier is an author, keynote speaker, trainer and consultant specializing in customer experience. She helps companies to design memorable, profitable experiences that transform customer and employee journeys.